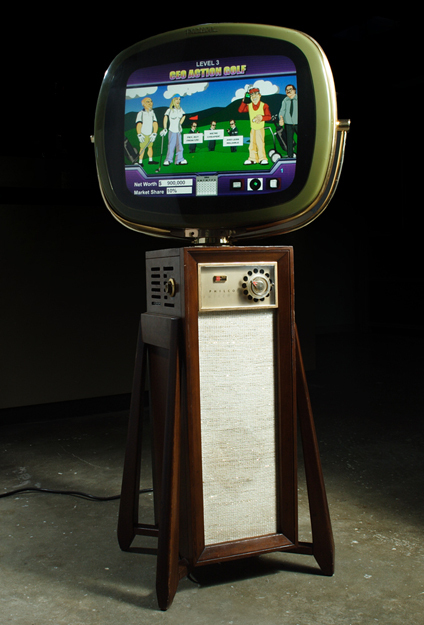 The Philco Predicta television set, built from 1958-1960, has always been a glorious piece of modern design, but even the contemporary reproductions weren't sufficiently functional to be much more than a fetish object in an already-crowded apartment. As luck would have it, we recently got the opportunity to transform one into a fully-functional experimental computer console. Dragged kicking and screaming into the silicon era, this thing has become a truly functional piece of equipment (ok, and it's still a fetish object, too). The casemod has been performed with the intention of preserving as much as possible of the aesthetic of the original, while still creating an object that could serve as a day-to-day computer. The unit was built for a client, to eventually house an experimental computer they're building, but many of the shots on this page show our testing with a computer we just had sitting around, a 2.8GHz P4 533Mhz FSB SiS 651 Chipset motherboard with 1GB of DDR RAM running Windows 2000. We delivered the completed machine in late July 2004.